A military dog regiment could transfer to the Defence Animal Centre (DAC) in Melton as part of a major reorganisation of resources by the government. 1st Military Working Dogs is based at St George’s Barracks in Rutland, which has now been earmarked for closure by 2020. The Melton site is home to the Canine Training Squadron which is responsible for delivering trained military dogs to the armed forces and teaching service personnel how to train, handle and look after the animals’ welfare. The squadron could now be joined there by the North Luffenham regiment according to the Defence Estate Rationalisation and Optimisation programme announced this week. The DAC. which occupies a 346-acre site off Asfordby Road, also hosts the Equine Training Squadron, which produces trained horses to the Household Cavalry and King’s Troop Royal Horse Artillery, as well as developing trained riding instructors and farriers for the mounted unit. Also at the Melton base is the Veterinary Training Squadron, which is responsible for the healthcare of the military working animals there and acts as a referral service for them. It is unclear at this stage whether the DAC has the capacity at present to take in the new regiment or if new buildings would be required. 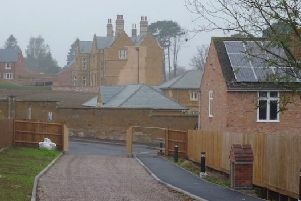 A final decision on what happens to personnel at St George’s Barracks, which is at North Luffenham and which also hosts 2 Medical Regiment, is subject to assessment. But it is recommended in the programme report that 1st Military Working Dogs could transfer to either the DAC or Kendrew Barracks at Cottesmore. Rutland County Council leader Terry King (Con) said: “The closure of St George’s Barracks has been a possibility for some time and the council has been in an ongoing dialog with the MOD and Defence Infrastructure Organisation (DIO). We will continue to engage with the MOD and the DIO in the months ahead regarding the future of the site. “In the meantime, both 1 Military Working Dogs and 2 Medical Regiment will continue to be based at St George’s and the council will continue to support them.